Following the Garden of the Courtisane which I posted about on February 7, soraya Vaher, designer for Violator, has two more new releases which I had the honour of modeling for. They are both VERY pretty while they still have that mysterious air about them. One is called Die Nacht der Leidenschaft and the second one is called Flammende Leidenchaft, both of which have roses, roses and roses! The Die Nacht der Leidenschaft is slightly less revealing with roses covering the entire front side of the left leg and has tentacles that has become a trademark of this brand, while Flammende Leidenchaft covers only the top with feathers insptead of tentacles. So the Flammende Leidenchaft has a slightly more feminine outfit. 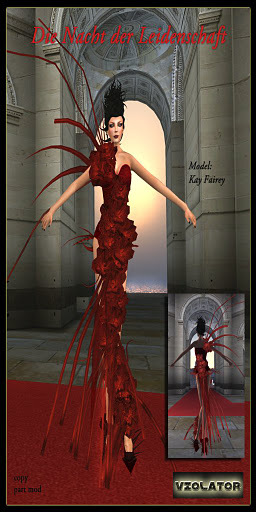 Posted by Kay Fairey, Agency Director and Top model for Boulevard Agency, Miss Virtual World Modeling Academy CEO, Team edo Director and writer for the Best of SL Magazine. This entry was posted in Uncategorized and tagged Uncategorized by Kay Fairey. Bookmark the permalink.